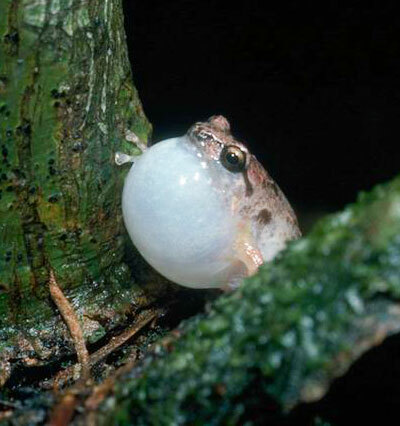 The Northern Ornate Nursery Frog (Cophixalus ornatus) is a common Microhylid frog species found in the forests of tropical Far North Queensland. A number of similar species from the genus Cophixalus are also found in this region, although they appear to occupy distinct geographical ranges, with little overlap. The tiny adults of this species are usually around 2.5-3.0cm in length and males make a high-pitched, squelching call to attract females. They often call from crevices in rocks, fallen tree trunks and other debri near the forest floor, making them difficult to find. ONF1 Typical advertising calls from male Northern Ornate Nursery Frogs (Cophixalus ornatus). Recorded at night in tropical rainforest, Dinden National Park, Queensland. ONF2 A further example of advertising calls. Recorded on Black Mountain Road, Kuranda, Queensland.